1. United States oil production has been increasing at about 2% per year since 1960. 2. Saudi Arabia is currently the largest producer of oil in the world. 3. Each country publishes information about its reserves. This gives us pretty good information about future oil production. 4. The following were the largest oil producing countries in 2005: Saudi Arabia, Russia, United States, Iran, China, Mexico, Norway, and Venezuela. Of these, which showed declining production in 2006? a. None of them. Oil production is growing almost everywhere. c. Six of the eight: Saudi Arabia, United States, Iran, Mexico, Norway, and Venezuela. 5. Increases in Canadian oil production as a result of developing the Canadian Oil Sands can be expected to offset declines in oil production elsewhere. 6. If oil production in an oil-exporting country declines by, say, 5% per year, oil exports are expected to decline by a similar amount. 7. Geologists are in agreement that worldwide oil production can be expected to continue to rise, at least until 2030. 8. If worldwide oil production were to decline at 2% per year for several years, this could easily be accommodated with little disruption. 9. If there is a worldwide shortage of oil, the richest countries can be expected to get the majority of the oil, and within those richest countries, the wealthiest people can be expected to get the largest share. 10. If we know that a major oil shortage is on the horizon, we can make necessary changes (develop alternative fuels and plug in electric vehicles, for example) in a five year period. 11. Even after oil production in an area declines, there is still a substantial amount of oil remaining in the ground. 12. Technological solutions will overcome the likely oil shortfall. c. We can’t know yet. Above is a graph (Figure 1) of US oil production. The blue line shows US 48 states total production; the red line shows the US total, including Alaska. 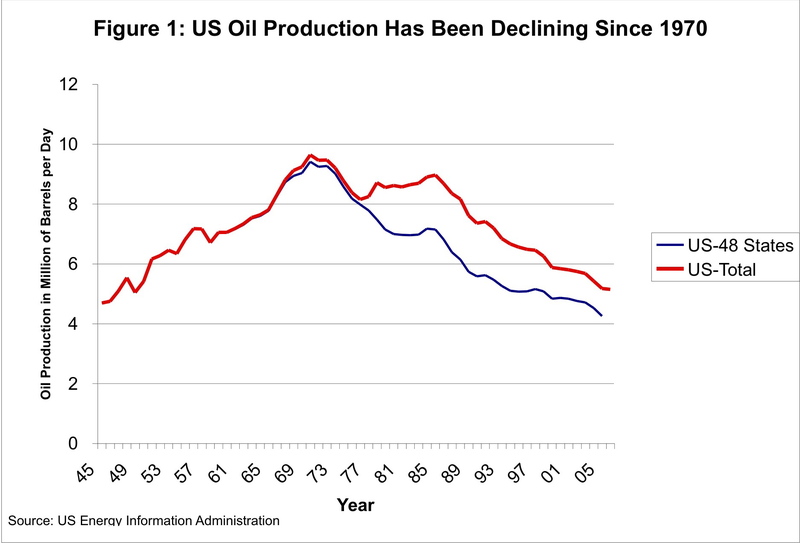 A person can see from this graph that oil production for the United States reached a peak in 1970, then began declining. The addition of oil from Alaska allowed production to reach a second lower peak in 1985, after which it began to decline again. The current rate of decline is about 2% per year. In most areas, oil production initially rises, then declines after about 50% of the available oil in the area has been recovered. For example, Figure 2 shows a graph of production from the North Sea (that is, near Norway and Great Britain). Production grew for several years, then reached a peak and began declining in 1999. If the United States does additional drilling in new locations, such as Alaska National Wildlife Refuge, or Jack 2, or along the outer continental shelf near Florida, geologists expect that US oil production (Figure 1) will show a modest increase for a few years, but will not approach the level of production seen in 1970 or 1985. Saudi Arabia was the largest producer of oil up until 2005, but its production recently has been declining. Russia is now the largest producer of oil. In 2006, Saudi Arabia produced 9,152,000 barrels per day while Russia produced 9,246,000 barrels per day, based on March 2007 US Energy Information Agency data. Saudi Arabia is the still the largest oil exporter. While Russia produces more, its population is greater, so it has less to export. 1. Reserve numbers appear to be seriously overstated for some countries, based on geological information from other sources. This is particularly an issue for Mideastern countries, such as Saudi Arabia and Iran. Questions have also been raised with respect to Russia’s reserves. Since reserve data is unaudited, there is no direct way of checking the accuracy of the reported amounts. 2. Even if oil is theoretically available, the amount of production in any one year may be very low because of technical issues. If oil is very thick, as in the Oil Sands of Canada and in Venezuela, it may be impractical to recover more than a very small percentage in any one year, because of the large inputs of heat (usually from natural gas) and fresh water required. Oil that is in very deep water, or that is in an area near icebergs, may also be difficult to recover very quickly, because of the need for special equipment. 3. Even if the oil is in the ground, a country can choose to delay production until later. We are used to countries producing as much oil as they can sell. If it becomes clear that there will be an oil shortage in future years, countries may decided to husband their resources (keep part of their oil in the ground, in case they need it later). Answer: c. Six of the eight: Saudi Arabia, United States, Iran, Mexico, Norway, and Venezuela, as shown in Figure 3 below. The fact that six of the eight largest oil producers have declining oil production in the first 10 months of 2006 is of concern because oil production in an area tends to rise for several years, and then decline year after year, once geological limits are reached. The fact that these six countries are showing declining production could mean than many (or all) of them have reached the point of geological decline, and thus can be expected to show declining production in the future. It is also possible that some of the declines in production are due to temporary situations, such as intentional reduction of production or equipment breakdowns. On the exhibit, we note that the United States, Mexico, and Norway have all indicated that their production declines are for geological reasons, and thus can be expected to continue. The situation is less clear for Saudi Arabia, Iran, and Venezuela, all of which are members of OPEC. 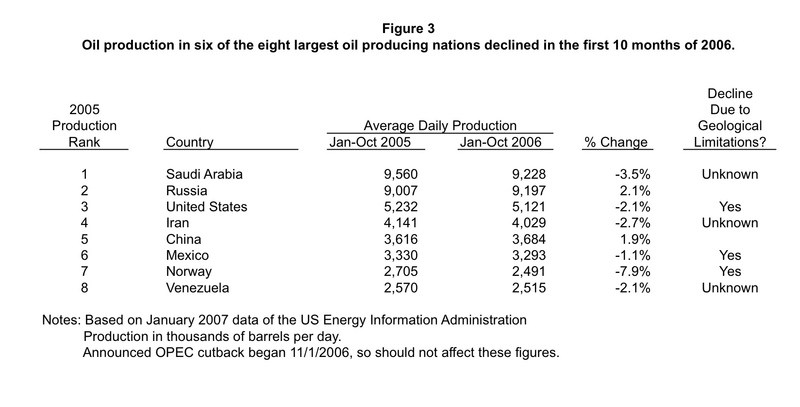 The reason the comparison in Figure 3 is made for the first 10 months of 2006, rather than the whole year, is because OPEC announced a reduction in production as of November 1, and cutting off the data at October 31 eliminates this potential distortion. Thus, this exhibit shows that even before the announced cutbacks, the three large OPEC producers (Saudi Arabia, Iran, and Venezuela) were all showing declining production. 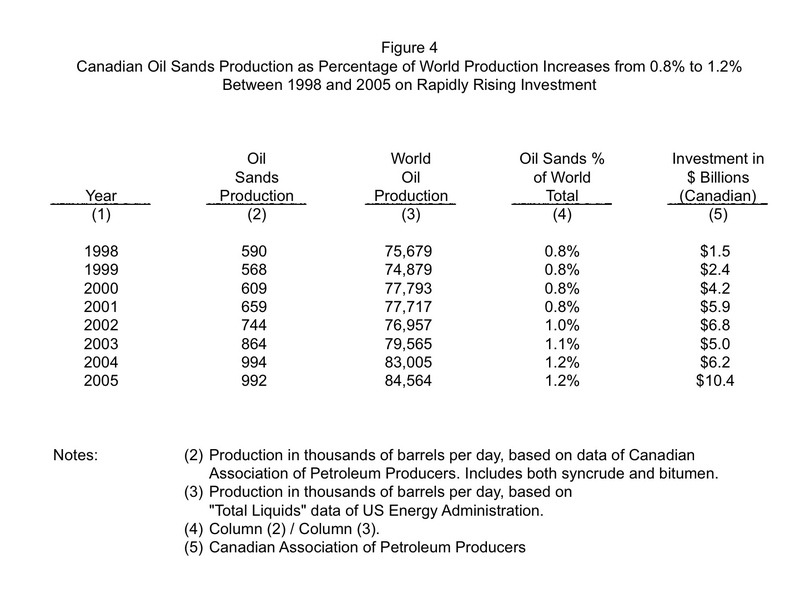 If we look at production from the Canadian Oil Sands, we find that it is only a tiny percentage of world production — 0.8% of world production in 1998, rising to 1.2% of world production in 2005, after billions of dollars of investment. Oil from the Oil Sands is extremely difficult to produce. Production requires large inputs of fresh water and natural gas, both of which are in short supply. There is also a shortage of workers and housing for workers. There is discussion about eventually replacing part of the natural gas with nuclear energy, but this will not overcome all of the difficulties. Given how low production is today, and how slow it has been to scale up, it seems unlikely that production will ever be large enough to offset a significant oil production shortfall elsewhere. Production of Oil Shale in the Western United States is expected to be even more challenging than Oil Sands production. The concentration of potential fossil fuel is much lower in Oil Shale than in Oil Sands, so even more production problems of the type encountered with Oil Sands can be expected. Given the slow progress with Oil Sands, Oil Shale seems even less likely to offset a major oil shortage. When a country increases its oil production, its internal usage tends to rise even faster than exports, as the population grows and some of the wealth filters down to the citizens of the country. When the oil production starts to decline, residents expect to continue their standard of living. As a result, countries tend to keep their own consumption at close to the same level, and reduce exports. This pattern was true for the United States when its production began to fall, and it seems to be happening in a number of other countries. Given these considerations, if a country’s oil production decreases by 5%, we should expect that country’s exports will decrease by more than 5%. We have already seen evidence that in a given area, oil production tends to rise for a number of years, then decline. Most geologists believe that on a worldwide basis, production will also eventually begin to decline. Opinions vary as to when the decline will begin. Typical dates are between 2007 and 2012, although some believe the decline will not begin until 2020 or later. 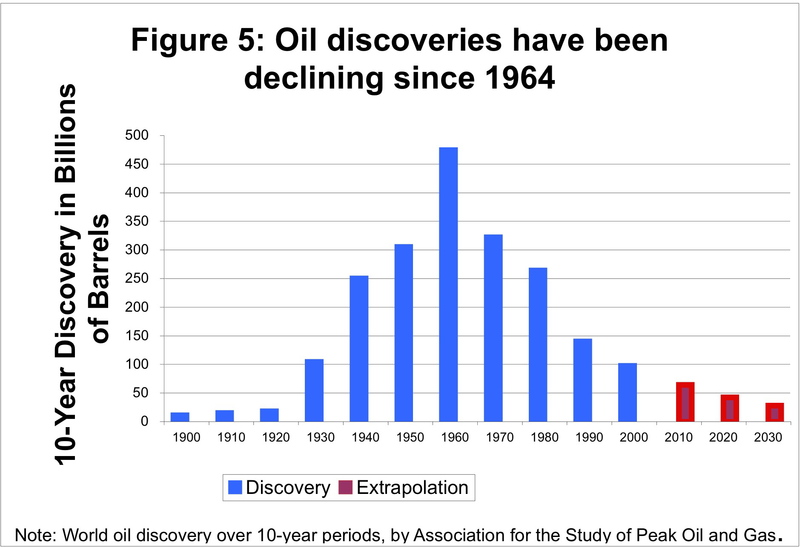 One reason why geologists are predicting a decline in production is the fact that oil discoveries (excluding Oil Sands, Oil Shale, and other “unconventional” sources) began declining over 40 years ago. The fields that have been found recently, including the much publicized Jack 2 field, tend to be fewer and smaller than the fields found years ago. While geologists generally believe that oil production will begin to decline in only a few years, governmental agencies, like the US Energy Information Agency, are projecting that oil production growth will continue until at least 2030. Some of the independent oil companies are also projecting long-term growth in production. Economists have had a surprisingly large say in this discussion. Their view is that it doesn’t matter whether oil production begins to decline or not. They believe that oil is like any other commodity, and that substitutes will be found. They also believe that scarcity will lead to higher prices which will lead to greater production and/or demand destruction, so that declining oil production will never be a significant issue. In recent years, worldwide oil usage has been increasing by about 2% a year. Much of this increase in demand is from China and from other oil-producing countries that have previously had a low standard of living. Because we are used to a 2% annual increase in oil worldwide oil usage, the 2% a year expected decrease needs to be compared to the prior increase of +2% per year. This amounts to a change of -4%, relative to what we are accustomed to — quite a big decline. If worldwide production oil decreases by 2% per year, the amount of oil available to importers is likely to decrease by more than 2% a year, for reasons discussed in the answers to Question 6. Because the United States’ own production is dropping at 2% a year, in recent years our imports have been increasing at 5% a year, to keep up with demand. If imports suddenly become less available, US supplies are likely to drop by much more than 2% a year. The US economy and the world economy use very large amounts of debt. When the economy is growing by several percentage points per year, there are enough funds available that most debtors can repay their debts with interest. If, because of oil shortages, the economy ceases to grow, or if it begins shrinking by a few percentage points a year, it is not clear this system can continue. There are likely to be many defaults on loans, and long-term loans, including mortgages, may become very difficult to obtain. Once it becomes clear there are likely to be oil shortages in the future, the behavior of countries is likely to change. We are already seeing oil producing nations, like Russia and Venezuela, unilaterally adjusting oil contracts to terms that are more favorable to themselves, because of their new, greater power. If it is clear that prices will be higher in the future, oil producers have an incentive to hoard their supplies for the future. Some countries with inadequate supplies may choose military approaches for obtaining oil, if the alternative is economic decline. For reasons discussed previously, oil exporting countries are likely to get a disproportionate share of the remaining oil, since they are likely to meet their own needs first. With oil shortages, oil producing countries find themselves with more power, and are able to rewrite contracts on terms more favorable to themselves. Thus, it seems likely that the amount of oil available to oil-importing countries will decline disproportionately to the overall decline. Within countries, governments are likely to allocate oil to what they consider their country’s most basic needs first – most likely agriculture, the military, and perhaps emergency services. If there is a shortage to begin with, once these allocations are taken off the top, the remaining amount of oil available to consumers is likely to be considerably lower than the total demand. It is possible the remaining oil will be sold to the wealthiest individuals, but if elected officials are involved, rationing may be more likely. The US Department of Energy commissioned a study titled Peaking of World Oil Production: Impacts, Mitigation, and Risk Management, by Robert Hirsch, Roger Bezdek, and Robert Wendling, published in early 2005. This study indicated that if existing technology is used, it would take at least 10 years to begin to mitigate a decline in oil production. Twenty years would produce a much better level of mitigation. The reason mitigation is expected to take so long is that there is so much infrastructure in place that uses the current technology. If a decision is made to increase fuel efficiency standards for cars, for example, it takes many years before this decision has a significant impact. First, it takes several years for manufacturers to begin making new models, then many more years before enough autos are sold to comprise a significant share of the US total. If liquid fuel is made from coal (a technology that has been around since World War II), it takes several years for factories to be built and new coal facilities to be developed. Because of these considerations, it is difficult to make any major change very quickly. If we are talking about developing new technologies, like plug-in electric vehicles or cellulistic ethanol, we should expect even longer lead times, since new technologies need to be developed and tested, before they can be implemented on a large scale. Even after production ceases, a substantial amount (typically 50% to 75% of the oil originally in place) remains in the ground. New production techniques have been developed over the years, but these have generally had only a minor impact on the percentage of oil in place that can be produced. 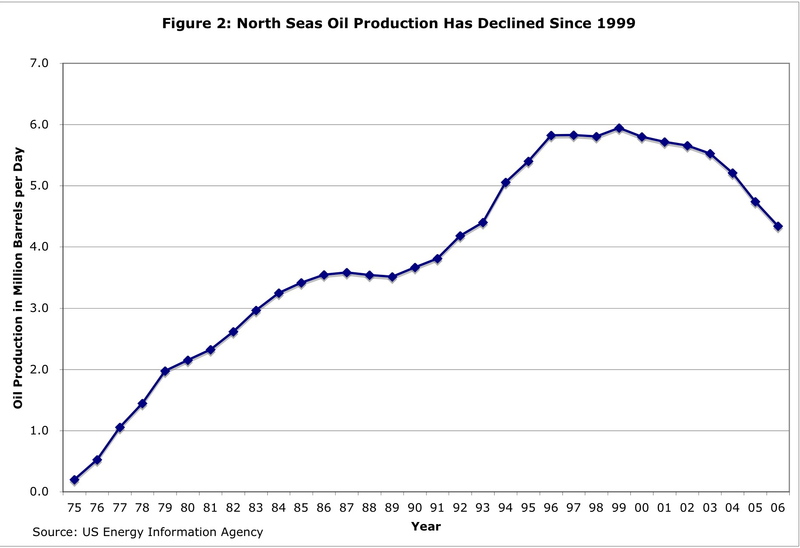 If one looks at the graph of the production for the US-48 states shown in Figure 1 above, or the production for the North Sea shown in Figure 2, one can discern little impact of new techniques in the last few years. Some believe that the primary impact of new techniques has been to remove oil more quickly, rather than to significantly raise the percentage of oil that can be recovered. Given that there is still a substantial amount of oil is the ground, there is a possibility that new techniques will be developed that will be able to remove a much larger portion of the oil in place in an economical fashion. If this can be done, an oil shortage can perhaps be avoided for quite a few more years. Answer: c. We can’t know yet. There is a very long lead time for any new technology to be implemented. It appears likely that there will be a shortage of natural gas in North America, in roughly the same time frame as the expected decline in worldwide oil production. Global warming is becoming a serious enough issue that it is questionable whether we should burn the additional fossil fuels that are in the ground, if we can get them out. We have a large world population and limited fresh water and top soil, limiting the amount of biofuels that can be produced. The above issues all relate to the fact that we live in a finite world and are approaching its limits. Researchers will need to understand all these various issues, in addition to the problem of oil shortages, to avoid trading one problem for another. If your family were permitted to purchase only five gallons of gasoline per week, how would this change your lifestyle? Geologists and economists seem to have very different ideas regarding the importance of the decline of oil. Who would you agree with? Why? Oil production in Mexico began to decline in the past year, and is expected to continue to decline in the future. In the past, revenue from oil income has been one of the country’s primary sources of tax revenue. What kinds of changes would you expect in Mexico, as production declines in the next few years? If you were the President of the United States and knew about the likelihood of oil shortages, what policies would you recommend? If you knew that it was likely that worldwide oil production was about to decline, would you tell the American people? Some people have suggested that there may be a link between expected future oil shortages and the war in Iraq. How likely do you consider such a connection to be? Given the likelihood of oil shortages in the future, what might be good careers for young people making choices today? This entry was posted in Financial Implications, Introductory Post, Oil and Its Future, Planning for the Future and tagged oil. Bookmark the permalink. Nice idea! I was thinking about writing something along these same lines. Will have to bookmark this for future reference. Nice idea! I was thinking about writing something along these same lines. So I will have to bookmark this for future reference.